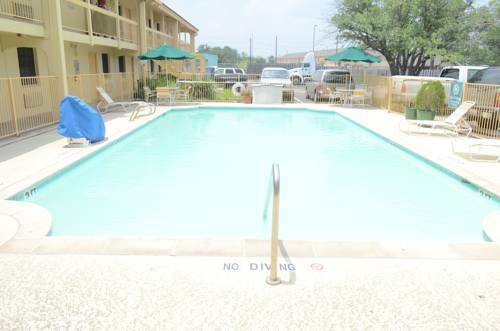 The Red Roof Inn Houston East is due east of downtown Houston, with convenient access to San Jacinto College and the San Jacinto Battleground. From here, enjoy quick and easy access to Downtown Houston, Minute Maid Park, the Convention Center and other area attractions. The hotel is located near most trucking companies, terminals and repair shops. The Houston Ship Channel is also nearby. The Red Roof Inn Houston East offers free WiFi, a flat screen TV, a coffee maker, iron and ironing board, and hair dryer in all rooms. Deluxe rooms and suites come with a p-top desk, microwave and refrigerator. Experience our coffeehouse style coffee, tea and continental breakfast in the lobby. Use the outdoor swimming pool at your leisure. One well behaved family pet is welcome. The Red Roof Inn Houston East is due east of downtown Houston, with convenient access to San Jacinto College and the San Jacinto Battleground. From here, enjoy quick and easy access to Downtown Houston, Minute Maid Park, the Convention Center and other area attractions. The hotel is located near most trucking companies, terminals and repair shops. The Houston Ship Channel is also nearby.